House Democratic leader Nancy Pelosi, left, LAUSD board President Mónica García, and board members Nick Melvoin and Kelly Gonez are joined by Democratic Rep. Lucille Roybal-Allard, center, on Wednesday at CHIRLA’s headquarters in Los Angeles. “DACA is dead. The Dream Act is a permanent solution for us, and that’s what we’re fighting for now,” said Paulina, an LA Unified graduate from Fremont High School and a DACA recipient who met on Wednesday with House Democratic leader Nancy Pelosi, LA Unified board members, and business and community leaders in Los Angeles to discuss the support needed to pass the Dream Act before the end of the year. 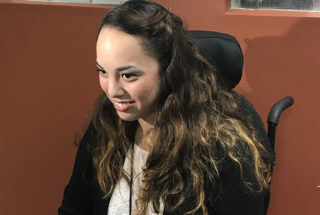 “I feel good about meeting and sharing my story with Pelosi because she at least gave us an approximate date when she believes the Dream Act can be passed in Congress,” said Paulina, who declined to give her last name. Pelosi told reporters in a news conference after the meeting organized by CHIRLA (Coalition for Humane Immigrant Rights) that she expects Congress to pass the Dream Act before Thanksgiving. The newest version of the Dream Act aims to permanently legalize undocumented youth who came to the country as children. The passage of a Dream Act in Congress would be a permanent solution for DACA immigrants. The Deferred Action for Childhood Arrivals — or DACA — for undocumented immigrants who arrived in the country as minors was created by executive order in 2012 by President Obama. It was rescinded by President Trump on Sept. 5, which will leave about 800,000 youth and young adults without protection from deportation or work permits after March 5. Those whose permits were not renewed by Oct. 5 have already lost the protections. “She giving us a tentative date definitely alleviates our uncertainty,” said Paulina, who graduated from UCLA. She is now preparing to enroll in a master’s program in leadership at USC. She arrived in the United States from Mexico when she was 6. Paulina, a DACA recipient, was part of the roundtable with House minority leader Nancy Pelosi in support of the Dream Act. “We are here in support not only of our undocumented students, but also our teachers and personnel. 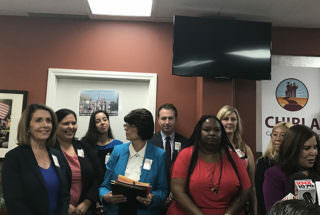 We have teachers in our classrooms, plant managers, counselors, principals, doctors who we rely on and that need our support,” said Nick Melvoin, vice president of LA Unified’s school board and who was part of Wednesday’s roundtable meeting along with board member Kelly Gonez and board President Mónica García. “We offer our support to make the Dream Act pass by sharing the stories of our families,” he said. The three board members were wearing buttons from the “We are one LAUSD” campaign, which was launched in August at the start of the school year in support of immigrant families. Gonez said the immigration debate has hurt attendance in LA Unified schools. “In my personal experience we have seen attendance drop last year when Trump was elected president,” she said. Melvoin said the same thing happened in some schools in his district.